The sole member of this Corporation shall be the Archbishop of the Roman Catholic Archdiocese of Seattle. The Corporate Member shall appoint the members of the Board from nominations made by the Board. Fr. 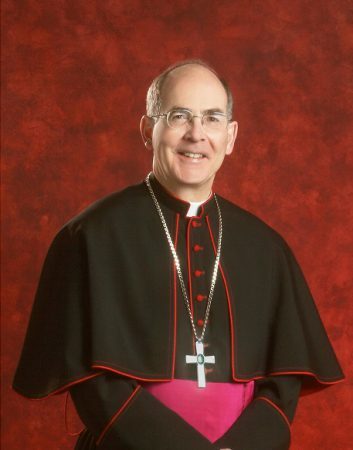 Hagelin was ordained to the Catholic priesthood in 2011 for the Archdiocese of Seattle. Fr. Hagelin was born in Seattle in 1983 and attended parochial grade school and Seattle Prep High School. He went on to Gonzaga University, where he graduated in 2006. He applied to be a seminarian for the Archdiocese of Seattle at the beginning of his senior year in college. He was accepted by his home archdiocese and sent the following fall to Mundelein Seminary which is the major seminary for the Archdiocese of Chicago. Fr. Hagelin currently serves as Pastor of St. Luke’s Catholic Church in Shoreline, and was appointed Vicar for Catholic Charities by Archbishop Sartain in April 2017. Dennis graduated with an Honors B.A. from Gonzaga University and later received his teaching certificate from the University of Washington. He taught in the Seattle Public Schools for eight years. In 2001, Dennis obtained his Master Degree in Public Administration from the Daniel J. Evans School of Public Affairs at the University of Washington. Dennis has been with the Archdiocese of Seattle since 1980, and has served in a number of different leadership roles. Dennis currently serves as Executive Director of the Chancery for the Archdiocese of Seattle. Joe earned his BS in Accounting from the University of Illinois in 1984. In his 30+ year career, Joe has held a number of different and increasingly responsible roles with finance, technology and biotech companies such as Arthur Anderson, Hewitt Associates, Westin/Starwood Hotels & Resorts, Expedia, BioLife Solutions and Corbis. In 2018, Joe was hired as the Chief Financial Officer for the Archdiocese of Seattle, where he manages the finances for approximately 200 Catholic churches and schools in Western Washington, with significant focus on operations, strategic planning, accounting, investments, risk management, and real estate. Michael is the President and CEO of Catholic Community Services and Catholic Housing Services of Western Washington. He was appointed to this position in 1979 by Archbishop Hunthausen. In 2002, he also became President and Trustee of the Catholic Charities Foundation of Western Washington. Michael also provides leadership to his organization’s limited liability corporations and partnerships for many low-income housing projects. Michael’s expertise is in structuring and transforming complex service organizations into integrated service delivery networks. Michael is a graduate of Central Washington University and also brings to his career his culture as an enrolled member of the Minnesota Chippewa Tribe, White Earth Indian Reservation. Sharon is a Professor and Director of the Doctor of Ministry Degree at Seattle University. She previously served as Pastoral Associate at St. Andrew’s parish in Sumner and All Saints parish in Puyallup. Sharon grew up in western Washington and has been active in the Archdiocese her entire life. She has overseen parish education for adults, children and youth; was the director of the RENEW program at All Saints parish; was part of initiating SALT (Scripture and Leadership Training) in the Archdiocese; and has directed and taught Scripture in 14 parishes from Bellingham to Battleground. Ned became Executive Director of St.Vincent de Paul Society of Seattle/King County in 2011. Ned has been working closely with Michael Reichert and other CCS/CHS leaders over the past several years to bring SVDP and CCS/CHS together in closer partnership. Ned has also been a strong supporter and active member of the Dialogue for Justice. Since 1975, Ned has worked in residential treatment with youth and families, and managed at every level within the juvenile court system. As director of services for the Kitsap Juvenile Department, Delmore was in charge of a 104-bed detention center and 100 employees in Port Orchard. In the last sixteen years in Kitsap County, he was credited with making Kitsap’s juvenile justice system more rehabilitative and less custodial and getting to the root of self-destructive behavior. Ned is a longtime Seattle resident and was a student at St. Joseph Parish School. Ed worked for 28 years as a manager in Patient Financial Services for UW/Harborview Medicine. After his retirement in 2007, Ed studied for and obtained State Licenses for Loan Origination and Life and Health Insurance Sales. Since 2009, Ed has worked as a contractor on special projects for UW Medicine Patient Financial Services. Ed earned his BA in Accounting from the Philippine College of Commerce in Manila, and is very familiar with non-profit health care operations, and government accounting and auditing. He is an active member of St. Matthew Parish in Seattle, serving many years as a member or as Chair of the Pastoral, School, and Finance Councils. He also serves as Coordinator for the North Seattle Deanery’s involvement with the Archdiocese’s Simbang Gabi Celebration every Advent. Donna has worked for the Department of Social & Health Services for over 20 years in a variety of capacities. She worked for 6 years as a Financial Service Specialist in the Tacoma Community Services Office providing public assistance such as food, cash and medical benefits to families impacted by a variety of hardships. In 2004, Donna began working for the Division of Children and Family Services as a guardianship and adoption social worker for children and youth in foster care. While continuing her work with DSHS, Donna also returned to school and in 2008 she graduated from the University of Washington with a Master’s Degree in Social Work. Since 2012, Donna has been responsible for the implementation of educational services and activities within Region 2 Children’s Administration (which includes the areas of King, Snohomish, Skagit, Island, Whatcom and San Juan Counties). Diane has served as the Executive Director of SHARE since October 1989. SHARE is a non-profit serving the hungry and homeless in Vancouver, Washington. When Diane began with SHARE, the organization had one shelter for homeless men and a hot meal program that served 24,000 meals a year. During the past 23 years, Diane has grown the agency and significantly expanded the number of programs and services being offered, to include operation of 3 shelters, 2 facilities for families, and the original Share House which serves single men. The Hot meal program serves over 125,000 meals each year. Services also include a street outreach program, a summer lunch program for children, and a food backpack program. Diane won the Service Provider of the Year Award at the WSCH 16th Annual Conference. Diane is a member of St. Joseph Parish and has served in a number of capacities with the parish including her current role on the Parish Finance Council. Jose Ortiz grew up working on farms together with his family, and has personal experience with the struggles of the farmworker community. As an adult, he has been helping farmworkers and youth in the Skagit Valley for more than 30 years. He has worked at St. Charles Church in Burlington for 21 years, and has served on many boards at the local, regional and national levels. Currently, Jose is Director of the Tri-Parish Food Bank, a cooperative effort of St. Charles Church (Burlington), Immaculate Conception Church (Mt. Vernon), and Sacred Heart Church (La Conner) that serves hundreds of people each week. Jose also directs the Youth Migrant Project, which gives youth from across the archdiocese a chance to spend a week in service to migrant families in the Skagit Valley. Sr. Sharon was born in Tacoma and raised in Seattle. She graduated from Blanchet High School and in 1963 entered the Dominican Sisters of Edmonds (now merged with the Adrian Dominican Sisters of Michigan). Sr. Sharon earned her nursing degree in 1969, and went on to work at the Edmonds Dominicans’ hospital in Aberdeen and at the University of Washington, taught at Seattle Central College, and provided public health and visiting nurse services, mostly for low-income families. It was while she was a visiting nurse that Sister Sharon joined the social justice committee of the archdiocesan Sisters’ Council in the mid-1970s. In 1977, Sr. Sharon began doing legislative work as part of the Washington State Catholic Conference, and served as Executive Director of the WSCC from 1997-2017. In 1991, she also earned her master’s degree in theological studies with a concentration in biomedical ethics from Seattle University. Sr. Charlotte has been involved with Community, parish, Archdiocesan and civic organizations her entire life. Her education includes a BScN from University of Portland, an MBA from George Washington University, and a JD from University of Puget Sound School of Law. Sr. Charlotte began her career as a teacher, and has extensive experience in healthcare leadership and management, governmental affairs, and law. She has held organizational memberships and offices too numerous to list!